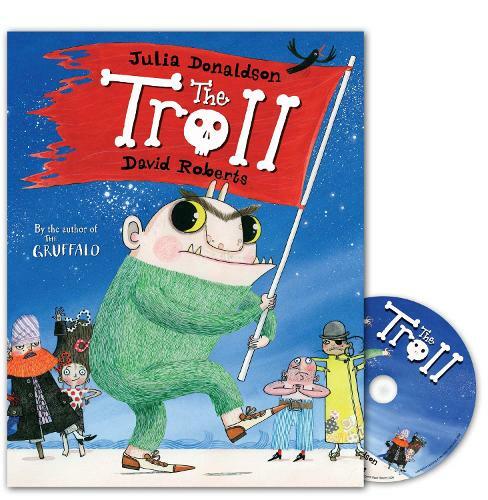 A laugh-out-loud pirate adventure from the stellar partnership of Julia Donaldson and David Roberts. The Troll longs for a juicy goat to eat - but he's stuck with boring old fish for supper. Bother! Meanwhile, Hank Chief and his pirate crew love fish, but without a decent recipe their slimy, soggy dinner is even worse. If only they could find their buried treasure and pay for a ship's cook . . . but it seems they've sailed to the wrong island. Again. Watch and listen to the fun unfold as two very different worlds collide in The Troll Book and CD Pack, a gloriously comic story from Julia Donaldson and David Roberts, the creators of the highly acclaimed Tyrannosaurus Drip. Enjoy the other stories by Julia Donaldson and David Roberts: Tyrannosaurus Drip, Jack and the Flumflum Tree, The Flying Bath and The Cook and the King.